I may be confusing Linsey’s and Davidson’s but Davidson’s is their wholesale competitor and has their own exclusives. Mostly what I've seen Davidson's do is send guns to cerakote shops to cerakote frames, slides, and barrels. Grabagun already has gen 5 g19 and g17 in fde and grey frames. This came today. I ended up selling my G48 and buying this instead. I’ve been wanting to buy another 19.5 (my current “back-up” 19 is a Gen3), but I may end up making this one my primary. I like the trigger much more than my early 19.5. Now I need to order a set of BOLD sights and another SCD. Good looking gun, TC! I wish Glock would have continued with the slide treatment. I do enjoy the frame and slide on my 19X. Oh well, I'll still probably pick one up. I am glad to see they are still doing the cut out and no slide serrations. Last edited by EJO; 02-18-2019 at 07:01 PM. I was issued a G17 Gen5 today for duty. The Glock night sights are not my favorite. I painted the rear tritium dots with flat black paint. I ordered a grip plug to clean up my mag changes. I removed the sharp edge on the front strap cut out. What BOLD sights you going with? I shot a Gen4 G17 last week with Ameriglo Hacks.....I did not think I would like them but they were fast. 25 and in are a plus, but beyond that.... it will be hard to be precise. Last edited by SW CQB 45; 02-18-2019 at 08:59 PM. If you're going to be a bear….be a GRIZZLY! I really like these. I preferred Heinie Straight 8’s for a long time, but my vision isn’t what it was 5 years ago, and I’ve found that the orange front sight really helps. Last edited by TC215; 02-18-2019 at 09:54 PM. I have the Hackathorn’s with the orange front sight on a G43 that I really like. 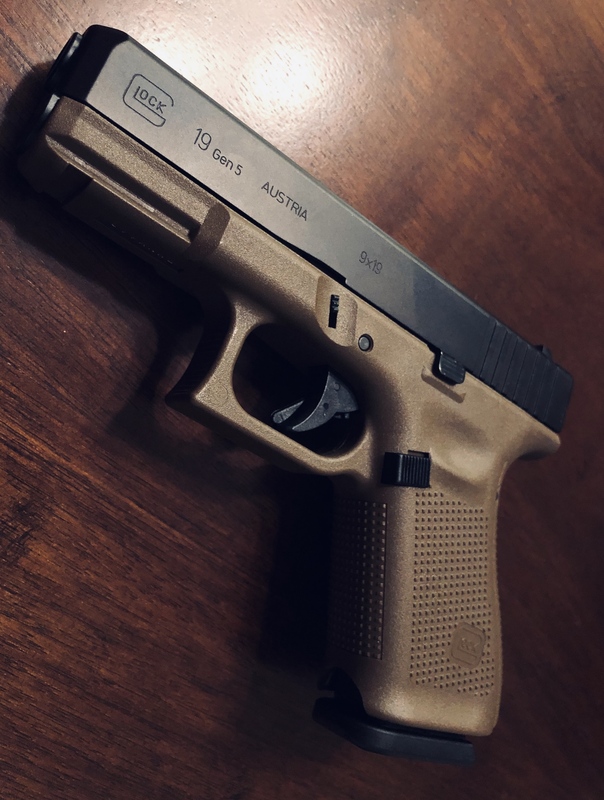 I recently purchased a G5 G 19 with Glock night sights that I really like as well. Also picked up a G 45 at the same time. I put on a set of Trijicon HDs with the green dot. They hit about 5 inches high at 25 and I had to file down the rear sight. Like the hackathorns the best of the group. The g5 trigger was a big upgrade over my g4. Thanks for the link TC, just ordered a couple more sets. here is my new issue. Really nice bone stock trigger with my home jobber hacks. The orange will probably be short lived out of a 7360/7378. Last edited by SW CQB 45; 02-18-2019 at 10:31 PM. You would be surprised. I have been using Ameriglo Bold sights for more than a year now in my 7360 and its holding up just fine. Im actually pleasantly surprised.